Why are the numbers 40-10 on the Association Standard? According to Regimental 'legend' the origin of forty-ten arises from a response that a soldier of the 2nd Battalion made whilst on parade. All serving and retired soldiers will be familiar with the command "From the right - number"! given by an NCO assembling his men on parade. Basically what happens is the first man shouts out "Number One" or just "One" and the next person on his right continues with "Two" and so on until the last man in the assembled ranks is reached. Thus does the NCO know how many soldiers are paraded for him. So if a Sergeant or Corporal has a thirty man squad, the last number he expects to hear is "Thirty"! So now you can guess what comes next from the 2nd Battalion all those years ago, forty-seven, forty-eight, forty-nine, forty-ten! 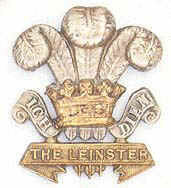 Far fetched though explanation may seem, this unofficial emblem of the Leinsters was used until the Regiment was disbanded in 1922. In my own army service of many years, I heard similar responses from nervous recruits on parade, terrified of doing something wrong. Likewise I can also imagine that a group of men, living together for years on-end whilst on overseas service, would remember such an occasion particularly if it was accompanied with mirth at the time (and no doubt apoplexy by the NCO). So a plausible explanation? We leave it with you to decide, however, do note that wherever the Leinster Regiment served around the world, either the 1st Bn or the 2nd Bn, it was a well known fact that you would find scratched somewhere on a wall, rock face or other surface the number 4010. We invite you, as you travel in search of Leinster Regiment locations, to seek out the 4010 carvings and let us know their location. Why was it used? It was the Leinster version of a modern equivalent that I frequently saw used in my own army career. My generation's version was "Kilroy was here"!